The Classic Blues 30 doesn’t disappoint. Most definitely one to try. The quality sounds that you’d expect. Nothing really, although even at its rated 30 watts it might be too loud for some uses. Back in the late 50s, post-war government import restrictions were still making American amps and guitars almost impossible to obtain in the UK, so there was a healthy demand for entrepreneurs who could provide credible homegrown alternatives. Jim Marshall listened to customers who visited his music shop in Hanwell and resolved to give them what they wanted. After several prototypes, the first JTM45 was born in late 1962 - and the rest, as they say, is history. Considered by many players to be the genesis of modern rock guitar amplification, the JTM45’s relatively simple circuit has proved popular with homebrew enthusiasts as well as independent custom builders. One of the more recognised builders in the UK is David Lane, who is known around Essex for his repair and custom work under the David Amplification moniker. Lane’s tribute to the JTM45 is his Classic Blues 30 head, and this month we’re looking at the standard model, which, circuit-wise, is quite faithful to the original. front and rear panels. The steel-riveted chassis supports a generously sized pair of transformers and a choke, with all the small components sitting inside on a meticulously fabricated turret board. Like the original, the Classic Blues 30 is a pure valve design, with three 12AX7 twin-triode preamplifier valves, a pair of vintage-correct KT66 JJ Tesla power valves and a GZ34 rectifier. 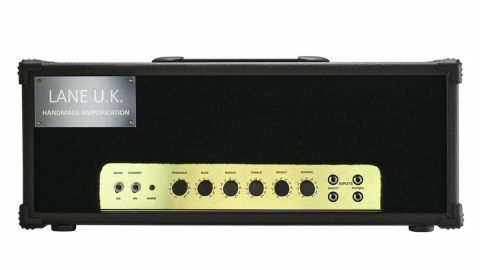 Developed in 1937 by Marconi-Osram Valve as high-quality British competition for RCA’s 6L6, the KT66 has a special place in the Marshall universe, pre-dating later EL34 designs and reputedly used in Eric Clapton’s iconic model 1962 ‘Bluesbreaker’ combo. Other top-quality components include Mallory caps and Alpha pots, with neat wiring and clean, bright soldering. One problem that small-production amp companies face is attempting a professional appearance without access to expensive custom-made parts. However, Lane has done a decent job, with brass screenprinted control panels that will darken a little over time, enhancing the vintage look. This amp exudes a reassuring, tank-like vibe that says it isn’t going to let you down. As usual, we tried the Classic Blues 30 with a variety of guitars, including a Strat fitted with regular output Duncan Alnico Pro IIs and a Les Paul loaded with an old pair of PAFs. Sonically, Lane is right on the money, with a Bright channel crammed full of harmonic zing and perfect for humbuckers. The warmer Normal channel is great with single coils, especially our Strat’s neck pickup. The shared EQ controls interact smoothly with no annoying peaks, and you can link both channels together with a short patch lead for more tonal range and a little extra gain, should you need it. Turning up the amp thickens the tone nicely as the KT66s start to add their own magic, with an addictive squashy response that’s enhanced by the GZ34 rectifier. Played with a Les Paul, it comes close to the ‘Beano’ album lead tone and sounds authentic for other hits from that era. Unlike some vintage heads, it isn’t too fussy about loudspeakers. We tried it with three different cabs loaded with Celestion, Eminence and Tone Tubby drivers, which all produced similarly impressive results covering a wide range of classic rock and blues sounds, from nearly clean jangly rhythm tones to singing sustain and harmonic feedback with the volume controls maxed out. Doing that experiment with a 100-watt Super Lead would loosen the fillings in your teeth. Thankfully, the 30-watt rating makes things more controllable, although with no master volume controls, an attenuator or an overdrive pedal pushing the front-end could be useful for home or studio use. Vintage guitars can be fun, although plugging into 50-year-old valve amplifiers can be risky. Overheating transformers, dried-out capacitors, resistors drifted from their original values, degraded wire insulation and dry solder joints all add up to unreliability and reduced safety, so it makes sense to use something new. Today, most hand-wired JTM45 boutique clones come from the States, so there’s a subtle irony that as Brexit and tariff wars push the pound’s buying-power down and US prices up, we’re looking once again at a homegrown, sensibly priced alternative, for similar reasons to those that influenced the original’s creation over half a century ago. Aimed at classic rockers and players who want to experience the tone of the British Blues Invasion, the Classic Blues 30 doesn’t disappoint. Most definitely one to try.